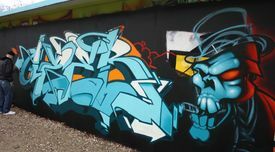 Another FatCap wall with a special guest, Ozer from the Love Letters crew. Live performance in Istanbul. Rusl in action! Does performing artwork for stickers. Dope! 2010 Wall of Fame 5. In Lille France. Mind blowing project in Melbourne.